Successfully Added Mini Heart Digital Photo Frame with Imperial Art Strap to your Shopping Cart. New heart-shaped digital photo keychain with designer tassle and woven art strap. The CVLU-F16 Digital Photo Frame makes finding your keys easy and can also be used as a rearview mirror decoration or fun item to hang on your backpack, jacket, etc. This digital picture frame comes with a full color 1.5 inch screen and forward/back buttons to easily scroll through the photos you store onto the device. 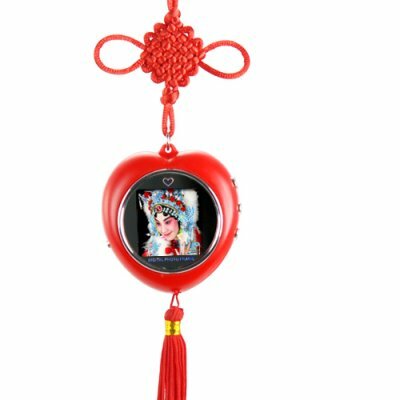 It comes with a decorative imperial art strap (also called a Chinese Knot) and its own internal software that allows you to easily transfer your favorite pictures onto it quickly and easily. The perfect sized gadget for carrying your favorite pictures along with you wherever you go, simply transfer your pictures onto the CVLU-F16, attach it to whatever you like (keychain, backpack, jacket, rearview mirror) and now you will always have your photos available to look at throughout the day. This mini digital photoframe stores 108 resized pictures and will take less than 10 minutes to transfer those pictures from your computer onto the device. A great little gadget to add to your internet store's feature page. With the holiday coming just around the corner, its time to put gift items on the front page, and nothing says love better than a cute keychain photo frame. It is available in our warehouse right now, so if you place your order today we can ship it out to you tomorrow!